University of Virginia Health System has received three national awards from the American Heart Association (AHA) and American College of Cardiology (ACC) for providing fast, quality care for heart attack patients. UVA earned the ACC’s NCDR ACTION Platinum Award, along with the AHA’s Mission: Lifeline Silver NSTEMI award and Mission: Lifeline Bronze Plus STEMI Receiving Center award, for meeting national quality care standards established by these two organizations. Quickly opening blocked arteries and restoring blood flow during a severe type of heart attack known as an ST-elevation myocardial infarction (STEMI). Ensuring patients receive all guideline-based medications, both during their hospital stay and when they are discharged. Referring patients to a cardiac rehabilitation program following their release from the hospital. Counseling patients on how to quit smoking. Evaluating the heart function of patients following a heart attack. 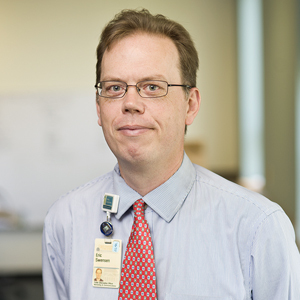 “I’m honored to be part of a team that provides lifesaving care to our patients and helps them every step of the way to make a full recovery,” said Lawrence Gimple, MD, director of clinical cardiology at the UVA Heart and Vascular Center. UVA’s interdisciplinary heart attack team – available 24 hours a day, seven days a week – brings together care providers from the Heart and Vascular Center, Emergency Department and Pharmacy. UVA has partnered with local rescue squads to develop an early notification system, so UVA is able to prepare for STEMI patients even before they arrive at the medical center. Once patients arrive, the Chest Pain Center inside the Emergency Department enables patients who may be suffering a heart attack to be quickly evaluated and treated. Five specialized catheterization rooms are also available to help treat heart attack patients. Heart attack patients are scheduled for a follow-up visit at UVA’s Heart Attack Recovery Clinic one week after being discharged from the hospital. At that visit, a cardiologist, exercise physiologist, pharmacist and dietitian help patients plan their recovery.